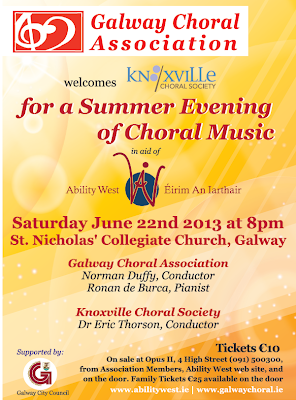 One of America’s finest symphonic choruses is partnering with Galway Choral Association for a concert in St. Nicholas Church on June 22 2013. Hailing from central Tennessee, the Knoxville Choral Society will be joining Galway Choral in a summer evening of choral music in aid of Ability West. An auditioned chorus of 150 singers, the Knoxville Choral Society represents a wide cross-section of occupations, including many professional musicians. They perform regularly with Knoxville Symphony Orchestra, commission new works and undertake European, Middle Eastern and Pan American tours. Over 40 choristers are taking part in their 2013 Ireland tour which includes performances in Dublin, Sligo, Kilkenny and Dublin, as well as Galway. Knoxville Choral Society is conducted by Dr. Eric Thorson, who is professor of music and director of choral activities at Carson-Newman University. Announcing the concert Michael O’Hare Galway Choral Association said that Galway choral music fans could look forward to a summer celebration featuring many well loved pieces from the choral repertoire. “Galway Choral Association is delighted to be partnering with the Knoxville Choral Society for this special concert in aid of Ability West. Under Norman Duffy's musical direction, we have put together an uplifting and varied programme which we hope will be enjoyed by locals and visitors to Galway,” said Michael. “The concert is being run in support of Ability West, a Galway based charity who have recently marked 50 years of service provision to children and adults with intellectual disabilities. I encourage Galwegians to support the concert and this very worthwile organisation which provides services and support to 500 children and adults across Galway City and County. The concert in St. Nicholas Collegiate Church starts at 8:00pm, and entrance is €10. Tickets available from Opus 11, High Street, ( 091 500 300), Galway Choral Association members and on door. Family tickets of €25 available on door.